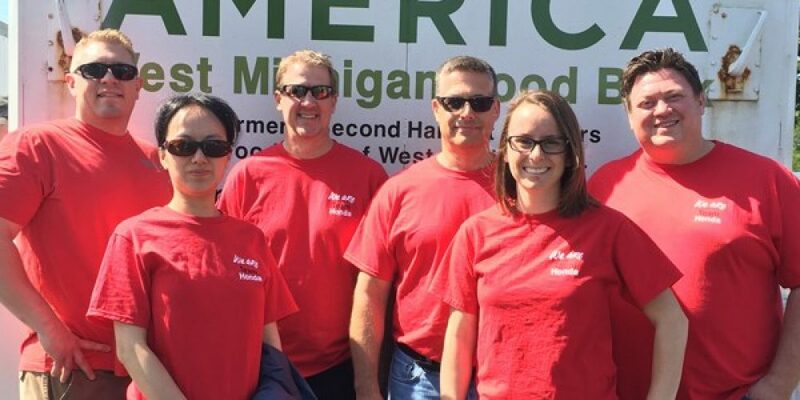 Shape Teams Up with Honda and St. Patricks | Shape Corp.
Honda North America partnered with more than 20,000 volunteers in over 43 states, as well as Canada and Mexico, to volunteer during their second annual Week of Services. From June 9 to 18, Shape and others dealers and suppliers participated in new or existing volunteer services of their own choosing within their communities. Shape chose to volunteer at St. Patrick – St. Anthony Catholic Church in Grand Haven, participating in Love Incorporated’s Feeding America initiative by volunteering at the church. The team members unloaded trucks full of vegetables and helped disabled individuals navigate through the line, get them their food, and take their food to their vehicles. Honda’s second week of services has concluded, but Shape continues to make a positive impact within our communities. For those who are interested, Love Incorporated has the Feeding America initiative every other Friday at St. Patrick – St. Anthony Catholic Church. There is no registration necessary, volunteers can simply show up and help out. Shape team members are always giving back to their community, and it is something to be proud of. See the photos below and learn more about the Honda Week of Service at their Facebook page and on Honda’s website.